Just to be clear, this dance is not from ancient Rome. Thanks, quotation marks and goofy font. Also, thanks Bill. 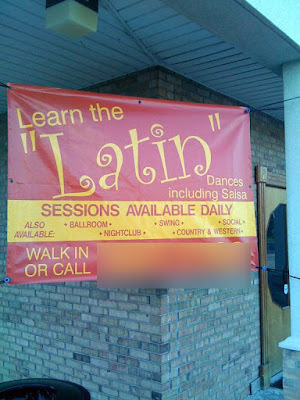 Just to be actually clear, those dances aren't actually Latin. They're mostly American dances to Latin music, sometimes completely butchering the original dance... That may not be what the people writing the sign intended, but I support those quotes!